Also serving communities of Celebration, Celebration. There are 31 Assisted Living Facilities in the Kissimmee area, with 13 in Kissimmee and 18 nearby. The average cost of assisted living in Kissimmee is $2,704 per month. This is lower than the national median of $3,346. Cheaper nearby regions include Haines City with an average starting cost of $2,095. To help you with your search, browse the 147 reviews below for assisted living facilities in Kissimmee. On average, consumers rate assisted living in Kissimmee 3.9 out of 5 stars. Better rated regions include Orlando with an average rating of 4.3 out of 5 stars. Caring.com has helped thousands of families find high-quality senior care. To speak with one of our Family Advisors about assisted living options and costs in Kissimmee, call (855) 863-8283. Kissimmee, Florida, is a popular destination for visitors of Walt Disney World Resort, Universal Orlando Resort and SeaWorld Orlando, just minutes away. Seniors may enjoy exploring downtown Kissimmee's boutiques, restaurants and parks as well as 14 assisted living facilities in the city or 44 nearby in Orlando, Saint Cloud and Winter Garden. In the city of Kissimmee, and all of Florida, assisted living communities are called assisted living facilities and are regulated by the Bureau of Health Facility Regulation. ALFs may provide services under a standard or specialty license, including limited nursing services (LNS), extended congregate care (ECC) and limited mental health (LMH). Standard homes are best suited for relatively independent adults who need assistance with daily tasks like getting dressed or taking a bath. Kissimmee is a resort city in Florida that has a crime rate higher than other cities in the state and higher than other comparable cities in the country. The cost of living in Kissimmee is slightly lower than other Florida cities and cities within the US. This makes the Orlando area an excellent place to live for seniors on a tight budget. Like most cities in Florida, Kissimmee has mild winters with temperatures that rarely drop below 50 and hot summers with highs in the 90s. The area gets about 25 percent more rainfall than the average US city. The Kissimmee area is home to world-class medical facilities, including the Florida Hospital Kissimmee and the Osceola Regional Medical Center, in the event of medical emergencies or illness. Kissimmee has an array of community resources for seniors, including the Osceola Council on Aging, which provides meals and adult day care, as well as five senior centers. There are several transportation options for seniors within Kissimmee. The Osceola Council on Aging offers rides for shopping and medical appointments. The Florida Department of Transportation also offers the Find-A-Ride service that provides curb-to-curb rides for seniors at discount fares. Assisted Living costs in Kissimmee start around $2,704 per month on average, while the nationwide average cost of assisted living is $4,000 per month, according to the latest figures from Genworth’s Cost of Care Survey. It’s important to note that assisted living rates in Kissimmee and the surrounding suburbs can vary widely based on factors such as location, the level of care needed, apartment size and the types of amenities offered at each community. Seniors who need assistance with ALF service costs can take advantage of two separate programs offered by the state: Medicaid Care Long Term Care and Assistive Care Services. Both are available for low-income individuals, and seniors may be eligible for one or both of these programs. 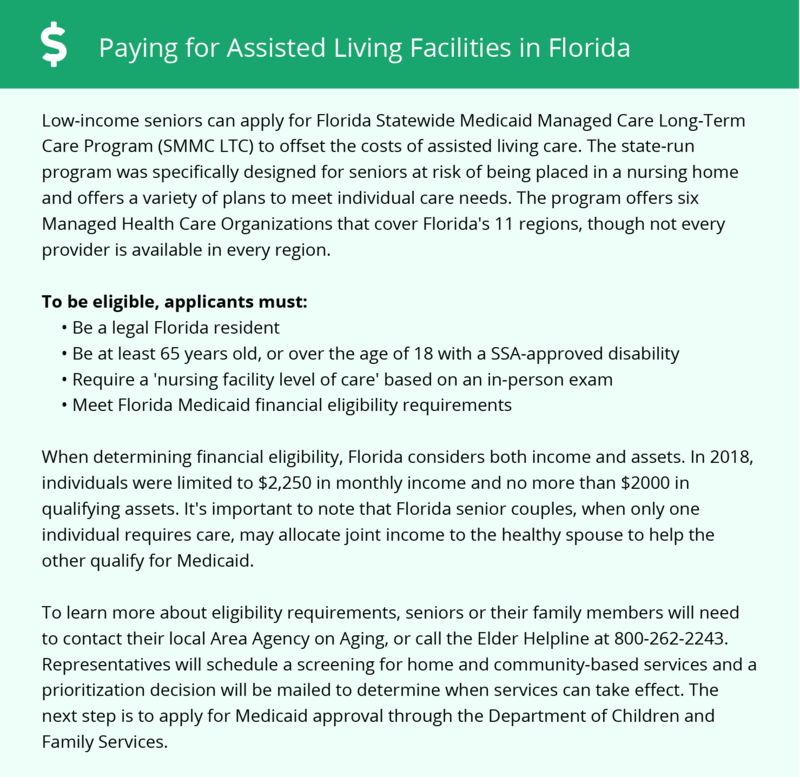 Florida also provides Optional State Supplementation (OSS) for seniors receiving Federal SSI benefits. To see a list of free assisted living resources in Kissimmee, please visit our Assisted Living in Florida page. Kissimmee-area assisted living communities must adhere to the comprehensive set of state laws and regulations that all assisted living communities in Florida are required to follow. Visit our Assisted Living in Florida page for more information about these laws.